If you are reading this Article you must have that experience or you must be making you choice to order somthing Online. I have had a whole lot of experience in shopping online and most of them were realy really great. But there are some of the Experience with me that makes me think thrice before getting into Online Shopping . Below is my Worst Experiences in the recent Times. Without a Doubt I respect this Company(Rediff.com) a lot and it is this very respect that hurts when it comes to shopping Online. While I had purchased online from Flipcart, zoomin, saholic, futurebazzar and many more vendors, with a Delivery and Shopping Experience much more relaxing. And specially with Flipkart the fast delivery and well organised information system through SMS, email etc. It was my first attempt to purchase a Weigh Machine form Rediff and I did it on 5th of July 2012. and on the same day it was despatched through te courier TNT as I got the sma and email. Than the Waiting for 2 days, 4 days, 6 day........9 days....12 days....15 days. and no information on the email regarding the delivery . 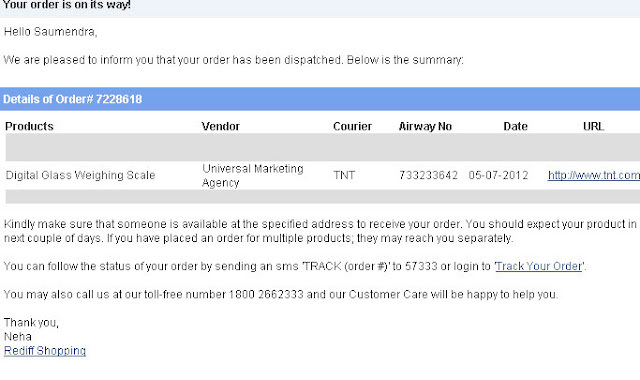 the Status in Rediff toll free IVR says he order is despatcehd and the Delivery reference numver is 18043010. 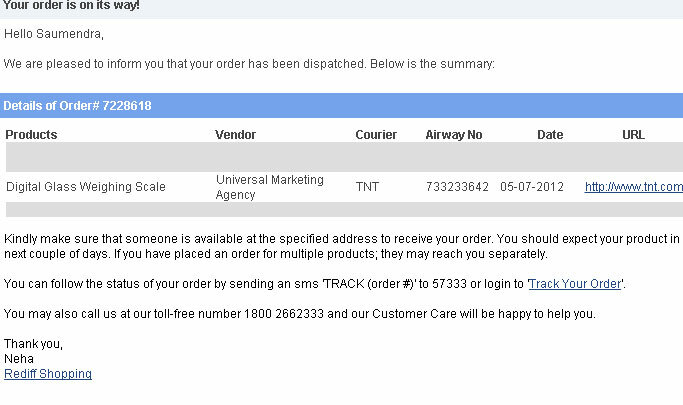 I was amazed with the IVR , as the Delivery Courier number given to me on the email is 733233642. Remember this is the 14th day or delivery and after talking to the Customer service , I was even more surprised when i got the answer is that the Delivery was returned from Vendor and will not be delivered due to some Reason he doesnt know. IVR Toll Free : It gives some number which is totally non-relevant to my order : 18043010 (despatched delivery reference number) ???? Customer Executive Explanation : The Product will not be deliver due to some problem at Vendor. Dont you this this is totally rediculous and unrealistic , when you were not getting any of the information for the Products status for so many days and suddenly when i asked the Customer care it all come to light that there were too many Problems going on . No Communication is been sent to the Customer on the status of such Problem(if actually happens). Last Worst thing is that they willl refund the Money, as that was conveyed by the Customer care , when i Asked on the Actual Status. (After waiting for so long the Results are too shpoking ) . What about the time and efforts that has been wasted on the same. Avoid using Online Shopping Through Rediff. Its total Bogus for me. Will not do it again ! I too anticipate huge articles by the Rediff godwill writers to Publish some good reviews of rediff experiences for stabilizing this Article. The Choice is Yours ,as we can learn from the experiences of others. I wish a Company of Status Rediff should have to look into this issue very seriously and make sure to deliver the best in service. Might be they loose many years of Goodwill if they dont Act fast and Act Sensibly. This Article is tentative to be Published in the Newspaper as an experience to Share for the People. We really Appriciate the Brand Rediff, nevertheless than this worst Experience. Saumendra, I think u must write to the CEO of rediff and you should even register a complain with consumer forum.